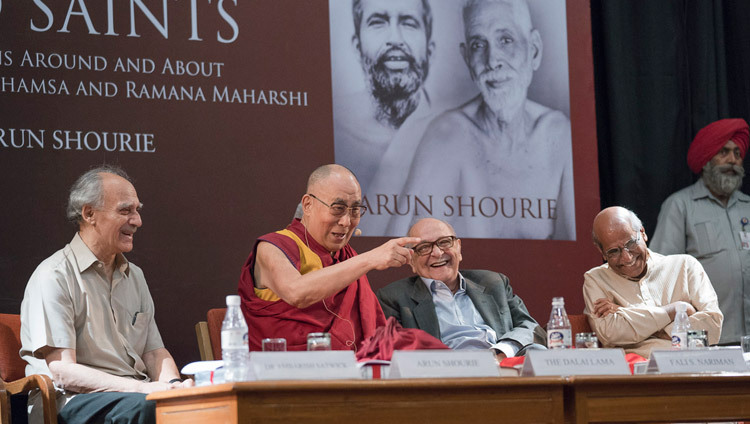 New Delhi, India – This afternoon, as His Holiness the Dalai Lama arrived at Delhi’s Indian International Centre in the sweltering heat, he was received by his old friend Dr Kapila Vatsyayan and his host, Arun Shourie. In the auditorium a representative of HarperCollins India introduced the occasion as the launch of Arun Shourie’s new book, ‘Two Saints’, which focuses on Ramakrishna Paramahansa and Ramana Maharshi. In his preamble Arun Shourie praised His Holiness. He said that given that the number of Tibetans in exile is smaller than the population of Karol Bagh, the fact that Tibet is a matter of world concern is due to his efforts. He also noted with admiration that His Holiness takes the view that Buddhism must face facts. He states that where empirical observation contradicts scripture, the facts should prevail. Shourie announced that it is his custom to ask his son, Aditya, who has cerebral palsy, to release his books. On this occasion he asked him to present a copy to His Holiness. Aditya did this as well as placing his hand on His Holiness’s bowed head—and the audience was palpably moved. He explained that he had tried to examine aspects of the two saints’ lives, their inexpressible peak experiences, out of body experiences and near death experiences in the light of current neuroscientific knowledge. He told the audience of almost 250 that he had invited three speakers to comment: his scientific collaborator Dr Amarish Satwick, former Foreign Secretary Shyam Saran and eminent jurist Fali S Nariman. Fali Nariman spoke wittily about the book, observing that Ramana Maharshi had suggested that converting from one religion to another is foolish, saying that the important thing instead is to stick to your religion and follow it properly. When it came to His Holiness’s turn to speak he began by telling the audience that he always prefers to be informal, addressed them as brothers and sisters and declared that he was happy to have the opportunity of addressing them. He added that it gave him great pleasure to see the faces of so many old friends before him, friends he has made in 58 years of living in India. This put him in mind of leading a meaningful life which he defined as serving others, bringing them happiness and at least doing them no harm. Turning to Arun Shourie he told him how much he admired the way he cared for his son and how touched he was to have received his blessing today. “What should I say?” he wondered, “Today, when I meet my Indian friends I am struck by the sense that although this body of mine is Tibetan, in terms of study and knowledge, I may be more Indian than you. This is because of what I’ve learned from ancient India and the Nalanda tradition about tackling negative emotions and strengthening inner values. We Tibetans are chelas or disciples of Indian gurus who have kept intact and alive the knowledge of ancient India that we received from you. One of my commitments is to revive that ancient Indian knowledge in this country. “You’re making material advances, but should also combine this with stronger inner values. India is the one country that can combine modern education with inner values and ancient knowledge that are a source of inner peace. This involves tackling negative emotions and nurturing those that are positive. We talk about prospects for world peace, but first we need to find inner peace. “In the more than 60 years that I have studied and analysed what I have learned of ancient Indian wisdom, asking myself, for example, what is the use of anger, my destructive emotions have almost disappeared. Before the arrival of Buddhism, we Tibetans were warriors, but with the coming of light from India we curbed our violent inclinations and became a more peaceful, civilized nation. His Holiness encouraged members of the audience to challenge him with questions and the first was about whether the workings of karma are just a figment of the imagination. In response he talked about causality and the observation that things have a substantial cause and cooperative conditions. He spoke of the different levels of consciousness and how sensory consciousness is relatively coarse. Consciousness on the level of dreams is subtler, in deep sleep it is subtler still, when we faint it is yet deeper and the subtlest level of consciousness manifests at the time of death. His Holiness went on to talk about the phenomenon of the 30 or so people he knows about over the last 50 years who have apparently accessed this subtlest level of consciousness. Consequently, following their clinical deaths, their bodies remained fresh for 1, 2 or 3 weeks until that subtlest consciousness departed. He said that it is the continuity of this subtlest consciousness that is the basis for the continuity of life after life. Asked how to strengthen tolerance, His Holiness recommended reading Shantideva’s ‘Guide to the Bodhisattva’s Way of Life’. Chapter 6 explains how to develop patience, while Chapter 8, focused on meditation, tells us how to reshape our emotions. Requested to advise how to make the best of this life His Holiness noted that all 7 billion human beings are physically, mentally and emotionally the same. All want to live peacefully and happily free from unpleasantness. And yet we face so many problems of our own making. This is because of our tendency to be self-centred and short-sighted. We forget that we are social animals with a basically compassionate nature. He said we need to reassess our system of education. At present it has largely material goals with little time to discuss inner values. There is a need to introduce explanations of compassion and warm-heartedness. He mentioned the curriculum of secular ethics, in which he has taken an interest, and which is nearing completion and implementation in schools. A questioner wanted to know what His Holiness considers to be reality. He mentioned the gap between appearance and reality, that things appear to exist independently, but when they are examined and analysed they can’t be found to exist in that way. Ignorance is to think that things exist as they appear; wisdom is the antidote to ignorance. Questioned about the difference between religion and spirituality, His Holiness suggested that secular ethics, a code of human goodness, is a kind of spirituality. In response to a request he defined liberation as true cessation—the cessation of suffering and its causes. Finally, challenged to say whether he will be the last Dalai Lama he reaffirmed what he first said in the 1960s that whether or not there is another Dalai Lama is a decision for the Tibetan people to take. 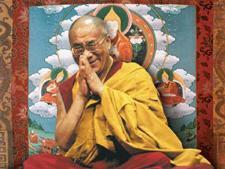 Tomorrow morning His Holiness will return to Dharamsala. The following day, at the Tsuglagkhang, he will give an Avalokiteshvara empowerment.